Boating is a great summer activity and in Ohio, there are many opportunities to participate in boating. Between the various lakes and rivers, many people in Ohio choose to own or rent boats especially in the warm summer months. Boating can be a very dangerous activity though especially if there are inexperienced boaters on the water. 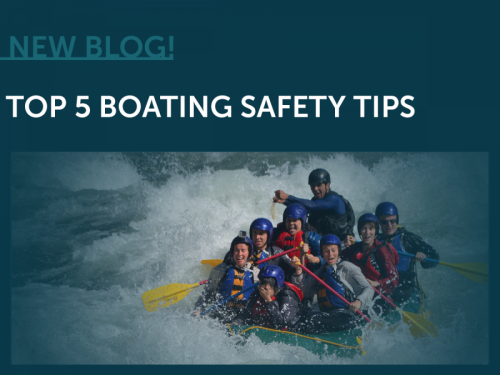 Below are the top 5 boating safety tips that we’ve gathered from several sources. Keep reading to make sure you and anyone else participating in boating activities practice safety first! Check the Weather: This will play a huge part keeping you and your friends/family safe when boating. Also, the weather can change fast so try to bring a radio to check on potential changes. Use U.S. Coast Guard Approved Life Jackets: While boating, even the most experienced participants need to be fitted for a life jacket and they need to wear it at all times. The only approved life jackets for boating are U.S. Coast Guard tested and approved. If you need help when purchasing life jackets, ask a store assistant who should be able to show you the proper ones to purchase. Education: You can always expand your knowledge by taking a boating class. There are safety courses and other ones available too. Many are online or you might be able to find some at local community spaces. See this list here for courses you can take. Avoid Alcohol: Studies have shown that if you drink while boating, your chances for an accident are doubled. On top of this, alcohol is impacted by the sun and wind, which means you might not know your limit as well as you normally do. Designate a Second Driver/Operator: Always have a second person who can manage the boat just in case something happens to the primary driver.